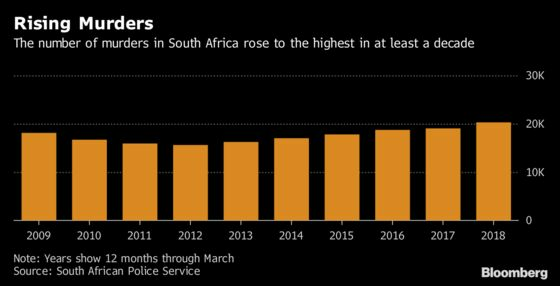 (Bloomberg) -- More than 20,000 people were murdered in South Africa in the year through March, the most in at least a decade. The murder rate increased to 35.2 per 100,000 people as the nation’s police service “dropped the ball,” according to newly appointed Police Minister Bheki Cele. That’s more than six times the murder rate in the U.S., based on the most recent FBI figures.